In a world dominated by computers, smartphones, and other electronic devices, finding a free outlet and charging cable to power your devices can be a challenge. One solution is to install USB wall outlets, which have USB ports either in addition to or in place of regular power outlets. With a USB outlet, you can plug your phone directly into the outlet while leaving the normal ports available for other appliances or devices. Many USB outlets are also equipped with chips that read how much power a charging device needs in order to provide the most efficient amount of power. USB wall outlets provide a great way to make your home even more device-friendly and convenient, and we’ve got our top picks ready for you. Our favorite USB wall outlet is the Topgreener TU21548A Wall Outlet with two AC power outlets and two USB-A ports. Each USB port has 2.4 amps of power for 4.8 amps total. The outlet also includes a smart chip that reads how much charging power a device needs to optimize the power supply. able to poke them with forks. The Topgreener is a top-rated outlet with lots of positive reviews, and we feel confident in adding our recommendation as well. Our second pick (though it was a close race) is also a Topgreener wall outlet, the TU21558AC. This outlet is similar to our other Topgreener outlet, but with one important distinction: this one has one USB-A port and one USB-C port. Although USB-A is still the standard for USB cables, C ports are being used more and more frequently. Despite that fact, we found very few USB outlets featuring C ports, so if you have devices that charge using a USB-C port, this is your best option. Like our top pick, this outlet is UL listed for safety, and the regular power outlets are tamper-resistant to keep young kids safe. 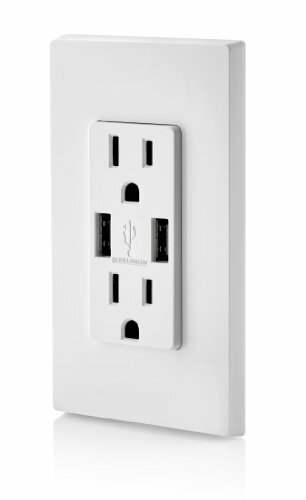 Among the few other outlets we found with a USB-C port is the Seckatech Type C USB Wall Outlet. Like the Topgreener outlet above, the Seckatech has two tamper-resistant power outlets, one USB-A port, and one USB-C port, earning it the number-three spot on our list. The USB ports get 4.2 amps of shared power, which is a little less than the Topgreener outlets but still sufficient to charge all kinds of devices. The Seckatech outlet has a two-year warranty—longer than the top picks, but still short of the five-year warranty of some other outlets. The Seckatech outlet’s standout feature is a small LED light that indicates when the USB outlets have power. If that light is off, you know that something isn’t working and any devices plugged into the ports won’t charge. The Leviton T5632 features many of the same things we like in the other outlets but has a little less power. It has two power outlets and two USB-A ports with a combined 3.6 amps of power. The power outlets are tamper-resistant, which we always like to see, and the outlet’s five-year warranty is the longest we found. Like the Seckatech, the Leviton reads the charging needs of attached devices to optimize the power output. It has the equivalent of a UL listing in Canada (specifically, a cCSAus listing), so it’s perfectly safe to use. However, without a USB-C port and with less power than the other options on our list, the Leviton ended up in the fourth spot. 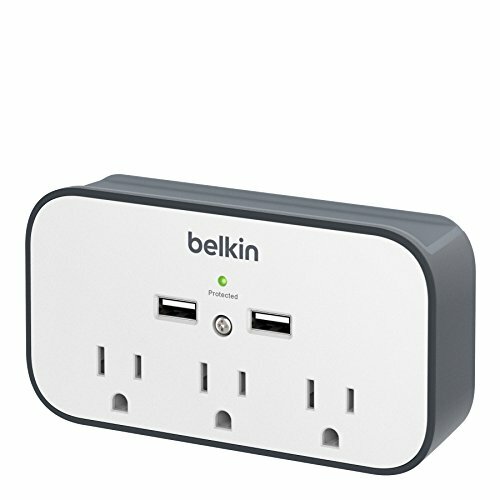 Although the Belkin BSV300ttCW doesn’t install directly into the wall, it plugs into an existing outlet to give you three AC power outlets and two USB-A ports. 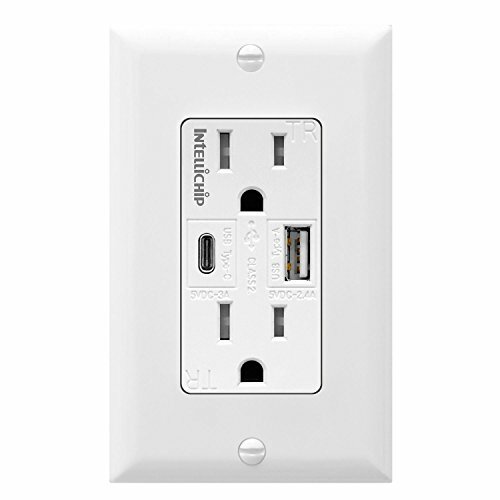 Although it’s not the most powerful USB outlet, the Belkin is much easier to use and install than other wall outlets. The outlet is also a surge protector, though with protection for up to only 540 joules, which is weaker than our recommended surge protectors. However, the outlet comes with a connected equipment warranty for up to $25,000. This covers devices plugged into the outlet if a power surge damages them. A small green light indicates when the outlet is protected. And for added convenience, the top of the outlet acts as a cradle for charging smartphones. Dimensions: 5.5 x 3 x 2.3 in. 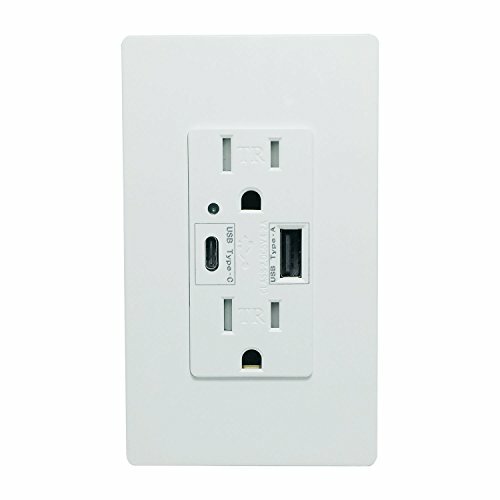 Are USB wall outlets safe? The quick answer is that yes, USB wall outlets are safe as long as they are installed correctly. Most outlets come with installation instructions. The process is fairly simple, but if you are unfamiliar with electrical terms or don’t feel comfortable doing it yourself, be sure to find someone who has experience to help you. To avoid electrocution, remember to flip the electrical breaker off for the outlet you are working on. Also, note that USB outlets are usually deeper than regular outlets, so you may discover that they don’t fit, depending on the construction of your home. If you’re worried about your device getting the right amount of power, most USB outlets have smart chips that read how much power is needed to get a full charge. If you have a particularly delicate device that you’re concerned about, stick with the device’s included charger to be on the safe side. Outlets with USB ports are not GFCI outlets and should not be used to replace them. A quick note about ground fault circuit interrupter (GFCI) outlets, which have“Reset” and “Test” buttons included on the outlet. They are strongly recommended for rooms with other water sources, such as the bathrooms, kitchen, garage, and laundry room. GFCI outlets work by noticing any abnormalities in the flow of the electrical current and cutting off the power before the electricity can do any damage. For example, if there is a surge in electricity to your hair dryer that might shock you, the GFCI outlet will notice the change within milliseconds and turn off the power before that can happen. 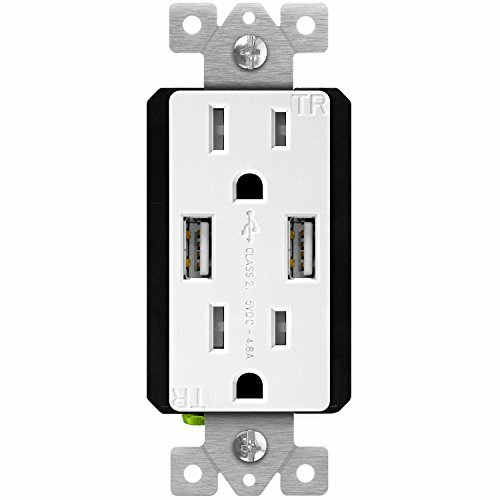 Outlets with USB ports are not GFCI outlets and should not be used to replace them. The GFCI outlets are there for a reason, and USB outlets do not have the same safety measures. USB outlets are best installed in bedrooms and living rooms without proximity to water. Wall outlets with USB ports certainly aren’t necessities, but they can be an enormous convenience. Make sure that you install the new outlet safety and correctly, and then enjoy the ease of plugging in anytime without having to juggle chargers and devices.